Q: How can I verify that a student who is requesting test accommodations is authorized through Student Ability Success Center? A: All students who have registered with Student Ability Success Center and completed the orientation will receive an “Authorized Academic Accommodations” (AAA) form. This form shows the student’s name, Red ID number, any accommodations he/she has been authorized to receive, and an expiration date if applicable. Please feel free to request to see a student’s copy of the AAA to confirm that he/she has indeed completed all necessary steps and is authorized for testing accommodations. When requesting to make arrangements to take an exam at the Test Accommodation Center, the student must also have a “Reservation for Testing Accommodations” (RTA) form completed by you for each exam. Q: How are students monitored when taking an exam at the Test Accommodation Center? A: All students, before starting an exam, are required to place any study materials that are not allowed on the exam and any personal items, including cell phones, into a locker located outside of the test rooms. Any materials that are allowed on the exam are thoroughly checked and blue books are swapped out. 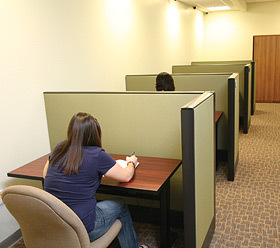 The student is then shown into a test room and given the exam. During the exam, the student is monitored by camera, a method that has been found to be less invasive that having a proctor sit in the room. Q: How should I get a copy of an exam to the Test Accommodation Center? A: There are different options to deliver an exam to the Test Accommodation Center. You can email the exam to tac.sasc@sdsu.edu or fax the test directly to our office at (619) 594-8477. You can leave the test in your department office by 2:00pm the day before the arranged test date and someone from Student Ability Success Center will pick up the test. You can also personally deliver the test to the Test Accommodation Center located in Calpulli Center 1300. Lastly, if none of these options are workable, you may place the test in a sealed envelope and the student can pick the exam up from you and bring it to the Test Accommodation Center. Your signature and the date and time you released the test should be written across the seal of the envelope. Q: How will exams completed at the Test Accommodation Center be returned? A: After the exam is administered it can be returned to your department office by someone from SStudent Ability Success Center. If the exam is completed by 3:00pm it will be returned to your department office the day of the exam. If the exam is completed after 3:00pm it will be returned by 10:00am the following business day. If you prefer to pick up the completed exam, we will hold it in the Test Accommodation Center located in Calpulli Center 1300 for you to pick up. If you need the test immediately, we can place the test in a sealed envelope and your student can return it to you. Our signature, date and time will be across the seal. When the test is returned, we will ask that a receipt be completed. We’ll ask for a signature of the individual accepting the test. The Test Accommodation Center will keep the receipt for our records. Q: I would like to allow my student to take the exam at a time other than the class time. How can I do this? A: When filling out the “Reservation for Testing Accommodations” (RTA) form please write the specific date and time that you are allowing the student to take the exam. Unless there is a conflict, it is strongly encouraged that the student takes the exam at the same time as the class. If you are allowing the student to take the exam at any time on a specific date or within a series of dates, please specify any restrictions on the RTA form. Q: I think that the student should receive more time than the class is receiving to complete the exam. How should I write this on the form? A: The majority of the students that have been authorized for testing accommodations have either time and a half or double time as an accommodation. In order to check a student’s accommodations, please ask the student to see his/her “Authorized Academic Accommodations” (AAA) form. If the student is authorized for time and a half or double time he/she will receive the accommodated time based on the amount of time being allowed to the class. If you are allowing your class 1 hour to complete the exam, please write this on the “Reservation for Testing Accommodations” (RTA) form. The student will then receive 1 hour and 30 minutes for an accommodation of time and a half or 2 hours for an accommodation of double time.